Newbury Park station had become something of an unsuspecting transport hub today - with services from Liverpool Street terminating short a surprising mass of passengers were being directed to this usually rather sleepy loop of the Central Line which swings east to the edge of Greater London. Getting out to Stratford had already been a slow and steady process, but now I found myself joining an unexpectedly busy Hainault-bound service for the final few miles to my destination. Plunging back into the earth after Leytonstone, we emerged at the tight curve where the Underground lines divide and ascend to assume the alignment of the former Great Eastern Railway line to Ilford. Almost everyone got off the train at Newbury Park to scramble for the buses departing from its curious modernist half-pipe shelter to destinations east, and suddenly we were rumbling along almost empty, high above scrubby grassland and distant lines of houses. Despite not being as far east or north as many of my walks in this quadrant, this zone had an unsettling sense of being at the very edge of things. East of the line, paddocks and yards gave way to rising ground and a promise of distant woodland. Meanwhile, west of the railway, the gothic upper section of Claybury Hospital's water tower glowered over a broad smudge of bare wintry treetops. Alone in my carriage I stood, crossing to look from each window in turn. The border between Redbridge and Essex ran a little north of here but I was unlikely to cross it on this walk. Instead I intended to head west and south, joining together some remaining fragments of the ancient Forest of Essex and crossing the route of other walks. While a let-up in the weather had been promised, the sky remained a featureless slab of purple-grey just now. Snow threatened on the sharp wintry air, and I wondered about the wisdom of attempting this in February, but these walks are precious escapes and I was determined to press ahead. I decided to stick with the train to its final destination, descending from the island platform at Hainault to an inconspicuous exit onto a quiet suburban street. I set off into the chilly wind, noting virtually no sign of humanity aside from a local slopping along in low-slung jeans, hood up, screen glued to face. He zig-zagged from pavement to pavement, bored and purposelessly playing chicken with the infrequent traffic as the long road stretched west between ranks of fading but solid villas. As I approached the interestingly named Fencepiece Road I spotted the distant tower at Claybury hovering ominously above the treeline. New North Road soon deposited me onto this busy arterial, lined by needlessly numerous hair salons and a few other businesses which huddled alongside the huge Old Maypole pub - a mid-century behemoth of a hostelry which tried to pass as an overscale thatched cottage but was betrayed by the curiously modern square towers which punctuated its curved faced. I set off northwards, intending to navigate the streets of a housing estate to cross towards Claybury Park. I noted the subtle climb becoming a steeper gradient as I meandered around a set of streets named for monarchs both real and imagined. As I turned briefly south to find an alleyway I caught a glimpse of the flat plains of land fringing the Thames between the houses. The sudden, sublime view spurred me onwards - and trudging through yet more streets getting increasingly tenuous in their royal links, I found my way onto Tomswood Hill. From here the views were perhaps even more impressive, and I eagerly crossed into the rough grassland fringing Hospital Hill Wood. The tower had dipped behind the trees, but to the south I had a clear view of a broad sweep of estuary from the distant blur of the Dartford Crossing to the glinting towers on the Isle of Dogs and the cluster of familiar silhouette-towers in the City. Turning west again I edged around the woods. The paths between the trees seemed inconclusive and very muddy indeed, and I knew that they would all eventually lead to the security fences of Repton Park, the sanitised name for the exclusive developments which now clustered around the former Hospital tower. There was no public access here, no way in without business and certainly no welcome for a lone walker with no legitimate purpose. Instead I decided to walk the wooded fringe of the park - part of the vast grounds in which the Asylum had been built. Repton's design. The architect's name was an acceptable substitute when evading the site's true purpose for the Estate Agents literature, and building to his design was finally completed in 1893 after municipal delay and industrial action. It is of course always easy to dismiss the ring of County Asylums which surrounded London as places of horror and misery - but Claybury was built to surprisingly high standards, and hosted the first ever laboratory to investigate the pathology of mental illness and numerous groundbreaking rehabilitative projects. Aside from that, the hospital housed the typical mix of the seriously mental ill, the elderly, the poor and unlucky and those judged too morally compromised to retain their liberty - almost 4000 patients at the peak of its activity. Passing into the NHS in 1948, and enduring despite the Acts of Parliament in 1959 and 1983 which saw care shift from institutions towards the community, the hospital - slowly deteriorating in fabric - finally closed in 1997. Then began a long public enquiry into the planning of the residential development on the site, and how many of the original buildings would be retained in the privatised and enclosed scheme which now placed an obstacle across the ridge of land. That said, I recognised too that it's unlikely I'd be walking this impressive green swathe of parkland had the site not changed in purpose. The surprisingly large park swung around the south-western edges of the woods, with Claybury Hall - an impressive manor turned exclusive apartments following a stint as a Health Authority HQ - peeking above the trees a safe distance from the Hospital. As I reached the western edge of the park I met a steady stream of dog-walkers heading in from Woodford Bridge, a rather quiet island of habitation which seemed to be cut-off from its surroundings. Everyone said 'good morning' here. It felt odd to be among people after such a quiet start to the day. I was heading downhill again - into the Roding Valley, and towards previous haunts. The weather had closed in, and the dark sky seemed to be pressing down on the valley floor. I had a few choices here - heading north or south on solid ground to cross the valley by road - or I could brave a footpath which appeared to skirt a playing field near Redbridge Lakes, a private fishing establishment. Naturally I chose the latter, and after an abortive attempt to use the boggy football pitch to make my crossing, I gave in and returned to the muddy trail beside the lakes. At the gates to the fishing club, I turned aside, following the trail into a tunnel of trees while my feet slurped through deep mud. I slithered my way along the path, noting a tiny, unnamed stream trickling in bedside me, and heading for the river. It was raining in earnest now, and I was thankful for my coat as I trudged onwards wondering about the wisdom of taking this route after all. Suddenly, the path opened onto a broad stony trail under the splayed flyovers of the incomplete M11 interchange. I'd been here before and I felt my spirits rise at the sight of the motorway, greeting it like an old friend. I sheltered under the southbound carriageway while I studied the map and planned the next leg of my walk. Realising it was going to be wet however I proceeded, I decided to press on under the motorway and over the swollen, fast-flowing Roding, emerging on Chigwell Road at a filling station I'd visited on a previous Roding Valley walk. I turned south here, crossing the street and heading into the Orchard Estate. This clump of sullen grey towers clustered with low-rise blocks, felt down-at-heel - the rain did them no favours at all, and nor did the barricaded front of the beleaguered general store and community centre. There were few people around, and certainly none who were heading along Broadmead Road where the street rose gently to pass over the Central Line a little south of Woodford Station. The road had the feel of an early twentieth-century arterial route: generous villas set back from the street, with a broad, straight carriageway heading over the bridge. This alignment of the road replaced the former route along the wonderfully named Snakes Lane which was now severed at Woodford Station, the level crossing incompatible with the frequent electric train service introduced in 1947. This has turned the urban centre of Woodford into something of a cul-de-sac, stunted and off the main route to anywhere in particular, but popular with the locals nonetheless. Perhaps that's why these edgeland hamlets have gained the favour of quiet-seeking city types? The new road curved gracefully between the lanes and crescents of pleasant suburban homes, before coming to rest on the High Road from Epping on the fringe of Woodford Green. Traffic churned the gullies of rainwater onto the pavement, but up ahead the sun was high and the tarmac glared brightly back at me. I walked south, looking for an opportunity to leave the road and enter the forest again. I was close to The Charter Road, where I'd turned aside from the forest trail on my River Ching perambulation, and I was eager to rejoin the path close to where I'd left it. After a march along the road through the forest, passing numerous private schools and nurseries which seemed to be a key industry in Woodford, I found a chance to regain the forest trail at Oak Hill. The path divided two cul-de-sacs, immediately turning into a muddy gully surrounded by trees. I slopped along, wondering how wise this was but still eager to walk the forest rather than along the surprisingly busy A104. There was some semblance of a surface in places - yellow stones lurking a little under the surface which provided some stability - but mostly it was a thick carpet of decaying leaves and a slick of watery soil. I tried to hug the margins of the path as I'd learned on my previous walk, but in places this just wasn't possible and I was reduced to a ginger skitter across deep puddles. My trusty boots did me proud again, keeping my feet dry and generally sinking deep enough to ensure I retained a vertical position. The path broadened briefly into a meadow between the road and the forest and I had a final chance to escape onto solid ground - but no way was I going to compromise, not now I had a layer of red clay on my boots and trousers. I was determined to press on. Shortly after plunging back between the trees, and after one of the wettest and muddiest areas I'd crossed so far, the path solidified. Up ahead the railings of the bridge over the North CIrcular could be seen. I'd rather looked forward to this crossing - this symbolic boundary which I've crossed and re-crossed during so many of my walks. It didn't disappoint. The footbridge cut across a section of the road enclosed by the forest. Looking east, traffic slowed for the junction at Waterworks Corner - where I'd have emerged too if I'd taken the road instead of this path. But to the west the view was majestic - the dual carriageway lurched north between the trees, opening a view over the Lea Valley. I could see the distant towers of Edmonton Green, and a shimmering surface of reservoir on the horizon. I spent a while watching the road before moving on. The next patch of woodland looked fairly small on the map, skirting the vast covered reservoir to the east, and crossing another footbridge into a larger area of forest. It was a slog through some exceptionally muddy terrain though, and I wasn't sorry to reach the solid surface of the second footbridge. The road beneath was surprisingly quiet despite trailing in from Tottenham and Walthamstow. Beyond the bridge I found a broad grassy area with a well-worn track leading across it. A small family group of dog walkers sporting muddied wellington boots passed by. More confident on this terrain I struck out ahead through the tall grass, my boots getting cleaned by the deep foliage as I walked. My confidence was soon proven to be misplaced: the track reached the tree line and dipped down a steep slope to gain the forest floor below. The slope was a mudslide. A near vertical slither at the least muddy spot, and a treacherous slope of sloppy clay elsewhere. The family with the dog had looped back and passed me, and the sight of them toppling, sliding and slithering down the hill put me off any attempt. I had to get a train back home tonight and a generous coating of mud beyond that I'd collected already was unlikely to sit well with with the guard I suspected. Instead I edged around the plot of land seeking a different exit. A small field of allotments was below, and there was a potential access onto the entrance road serving them. However, looking at a disgruntled gardener wheel-spinning his aging Volvo to gain traction suggested this wasn't going to work either. I felt a little thrill of concern - a kind of range anxiety perhaps - which was mostly unfounded: I could retrace my steps over the footbridges and back to the road of course. But it would be a long detour and would take some time. I realised I'd not eaten and I was feeling the effects of the walk so far on my feet and my stomach. It was a dispiriting moment. I walked the edge of the road, trying several possible routes down the steep slope to no avail, until I came back to the footbridge. It seemed I was retracing my steps. Crossing the footbridge, I noted some seemingly well trodden paths down the clumpy grass of the embankment on the northern side. On investigation it was a fairly straightforward scramble down a grassy bank, and I soon found myself directly below where I'd been moments before. I was relieved - I'd had to track back a short way, but at least hadn't needed to recross the North Circular. Instead I set off east, over the cattle grid to the junction with Woodford New Road. This long, straight and busy thoroughfare cuts directly south through the forest, and I was inevitably going to find my way back to it somewhere on this walk. Setting off I passed a couple planning a walk in the forest, who clearly had second thoughts on seeing my dishevelled and grimy appearance. The road was wearingly straight and busy, and the sun had made for a warmer walk than I'd expected after the wet, chilly morning. I soon passed the point I suspected I'd have emerged from the woodland if I'd been able to make the scramble: I was back on track. On the opposite side of the road there were further tempting paths leading into the trees but I couldn't chance another detour and stuck to the road, soon passing the entrance to Forest School where I'd walked once before with a former pupil. A route along Snaresbrook Road and through the scrubby forest edge suggested itself, but I continued to stick with the footpath I'd chosen, navigating the roundabout and heading east again onto Whipps Cross Road. This stretch of road along the edge of the Hollow Ponds and near the hospital was familiar from a disturbing and disorienting night-time bus journey from Bakers Arms a few years back. That bus journey was haunting and strangely mesmerising - the unfamiliar scenery and the stern Victorian architecture of the hospital looming out of the dark as I passed into unfamiliar suburbs had created a strange impression on my memory. It was made worse by facing a potentially difficult social negotiation at its end. Whipps Cross road in pleasant winter sunlight was wholly different. The ponds glinted, busy with wildfowl and well used by locals, while the towers of the hospital peeked benignly from behind their tree-curtain. I wondered if this would erase the odd phantasmagoria of the earlier trip? I trudged along, tired and hungry, my goal being to find food before deciding how to end this rather poorly planned excursion. 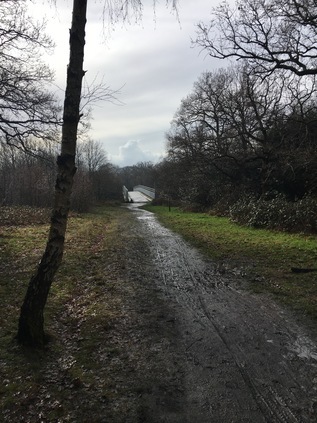 I realised there was a more interesting route to be found on the forested side of the road, but I already knew I needed to revisit this area to reconnect it with Wanstead Flats, so staying dry and surefooted was no loss today. I slogged on, watching the traffic tearing by to reach the A12 as its controversial course weaved around the terraces of Leytonstone. Relaxing in the lowering sunshine outside a ludicrously busy Tesco store, I ruminated on how strangely the walk had turned out. The dismay at needing to turn back, the slow hard slogging through mud, and the unsettling reconnection with an old memory had been challenging. But the last stretch leading to this spot had involved crossing a footbridge over the A12 in its concrete channel offering views south and west towards the city. 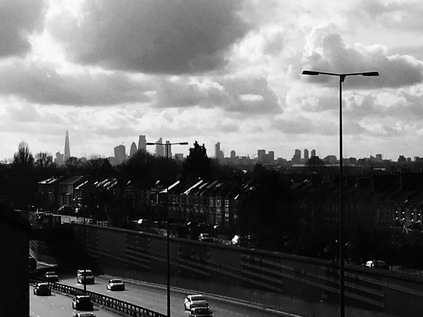 The panorama had been striking, with the terraces of Leytonstone framing the distant towers and columns and setting them in a strange context. Things felt like they were swimming into focus. Nothing seemed far from anywhere else just here. I still had time and a little refreshed energy - so perhaps I could connect this walk to something after all? I recrossed the main road by way of the modern addendum to Grove Green Road which snakes across to reach the older victorian byway to Leyton. It was comforting to be making good progress on a quiet pavement, and the area was interesting - previously seen only from passing trains or cars, but surprisingly close to where I'd walked many times before. Passing under the low railway bridge with dire warnings to diverted buses, I emerged alongside the linear park which filled the tiny sliver of land between the road and the concrete gully containing its shudderingly busy modern counterpart. As it dawned on me where I was, I came upon Claremont Road. Or at least I came upon the stub-ended brick wall at the end of a tiny inlet where it had once been. There were no houses in the street, just about room to park an off-duty white van or two. Claremont Road had gone, torn apart by the deep cut of the A12 as it progressed northwards to join the M11. This was the site of the last stand - the occupation of this street by a group of protesters with considerable local support had delayed the road scheme. A tiny republic formed within the monarchy. A lawless but self-regulating community with a single purpose built watchtowers in the beleaguered street and strung nets between the homes to keep the bulldozers at bay. Meanwhile a single elderly resident made tea and gave advice to the young protesters. I imagined her navigating all of the strained emotions and romances that being caught up in that heady moment of resistance must have invoked in the young and idealistic minds. Calming, soothing and reassuring, she'd seen worse - a war, austerity, the rapidity of the modern world encroaching. Their petty dramas, even the bigger drama being played out via the siege at her doorstep must have seemed part of the flow of things. But now the street was gone, the A12 had prevailed and its traffic echoed by the end of what was left of Claremont Road. Progress had overtaken all of the events, large and small, and the towers and gates and allegiances had all been swept away. Coming upon the street by accident was a unexpected experience - when it crossed my mind this would be along my route I'd been convinced I'd missed it, or got entirely the wrong location - but here it was. The brick wall was a stark reminder of the fate that befell the residents of this quiet dead-end street which became a symbol of a wider environmental struggle in those fervent days. I was beginning to slow down, my feet sore and sluggish after their trawl through the muddy forest. Grove Green Road stretched, straight and long, towards a crossroads where everything seemed to fall into place. If I continued ahead I'd end up reversing my recent walk around the Olympic Park, if I turned north I'd be heading for Bakers Arms and the site of a restless and strange night. Instead I turned south, crossing the bridge outside a busy Leyton station, people pouring from the entrance. I took the bus instead - making sense of this somewhat impromptu wander needed a slower pace of travel. My route cut across everything - from the valleys and ridges I normally use to guide me to my perceptions of some of the areas I'd covered. 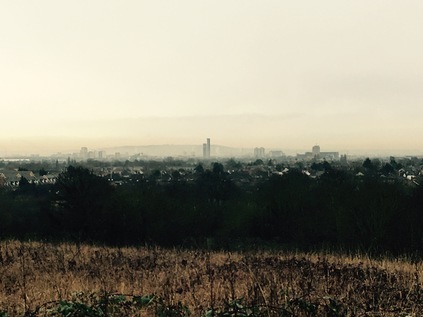 I'd demystified the horror of Whipps Cross and re-examined the view from the North Circular from a new vista. Sleepy, down-at-heel Hainault and the tower at Claybury seemed distant indeed - but the new links I'd forged brought them into my London mythology. The tongue of forest curling into the city needed further exploration for sure, but today this most ancient topography had given form to my wander. Thankfully, I slipped into the bus seat as we sped towards Stratford.